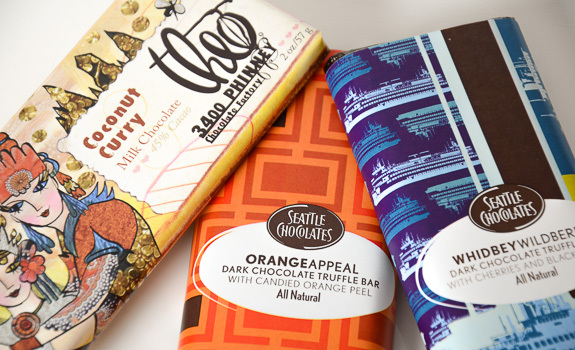 Three curious chocolate bars from Seattle — one from Theo, and two from Seattle Chocolates. These three chocolate bars were all gifted to NEAROF! by my dad, who bought them during a trip to Seattle. All look to be delicious, flavourful treats, yet all are hard to find in this corner of Canada. Trying exotic foodstuffs with limited availability can be fraught with mental anguish. If you don’t like the product, no worries. But if you do like it, there’s a reasonable chance you’ll never be able to get it again, unless you’re willing to pay absurd shipping fees, deal with customs charges, and then ration the item like the $100 bottle of wine you bought to celebrate a special occasion, but that you never want to open no matter how special the occasion because there’s always a chance there’ll be a more special occasion next month. See? Mental anguish. While I really have no idea where to find Seattle Chocolates chocolate bars in Alberta, I thought I spotted some Theo chocolate bars at Duchess Provisions in Edmonton, so I phoned to confirm. Sure enough, unless this has changed within the past couple months, they carry a selection of Theo bars. That’s only 300 km from NEAROF! HQ – much closer than Seattle – making it an exotic treat only somewhat out of reach. Regardless, I plan to savour each bar while I review it here. All prices are in U.S. dollars, and all bars were purchased at Bartell Drugs in Seattle. Cost: $2.99 for a 2.5 oz (70 gram) bar. Review: Described as a “dark chocolate truffle bar with cherries and blackberries,” I was expecting a whole lot of berry flavour right out of the gate. Sure enough, loads of berry. There are chunks of tough, chewy dried cherries in the bar, which adds some nice character to the chew. The blackberry taste comes from “blackberry powder” and “blackberry flavour,” so don’t worry about getting a mouthful of seeds. The chocolate itself is good, but not outstanding; it melts nicely in the mouth, but is otherwise a bit too stiff and powdery. Even though the bar’s “best by” date is July 7, 2013 – and I’m sampling it on April 16, 2013 – it tastes pretty borderline. Still, I’d totally buy a fresh bar if I saw one. Review: I’m big on the orange/chocolate pairing, and I demonstrate this love every Christmas by whacking, unwrapping and devouring a Terry’s Chocolate Orange far more quickly than my belt would appreciate. 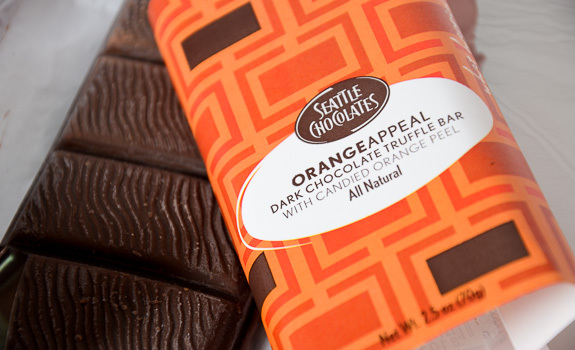 Instead of simply infusing their chocolate bar with an orange essence, Seattle Chocolates has opted to throw in some candied orange peel to make it that much better. The idea reminds me of the amazing lemon-peel-laced Lemon Dream Chocophilia bar from Kerstin’s in Edmonton. Orange Appeal is INTENSE. There’s orange oil in the chocolate, which gives it a round, mouth-filling flavour, but some of the pieces of candied orange peel are rock hard; to be clear, I feared for my teeth. Again, the “best by” date is dodgy. June 2, 2013? While I can taste how good this bar would have been fresh – if you like chocolate and orange together, this would be fantastic – I’d feel ripped off if I bought it today and it tasted like this. Cost: $2.99 for a 2 oz (57 gram) bar. Review: Coconut? Sure. But yellow curry in a chocolate bar’s ingredient list? Strange, strange, strange. This fair-trade, organic chocolate bar’s appeal is as a foodie curiosity. Coconut and curry are a wonderful flavour pairing, but how does that match with the sweet, creamy taste of milk chocolate? In a nutshell, this bar is a hot mess. It’s got some surprisingly spicy heat and the coconut contributes a nice roughness to the texture, but the flavour simply doesn’t work. While I commend Theo on not playing it safe with the curry powder, it’s too overpowering to be enjoyable. Too bitter, too hot, too oddball for my liking. How laced with curry is this bar? There are yellow stains all over the inner paper-foil wrapper. Eek. The verdict: Granted, they were a tad stale despite the “best by” dates being well within acceptable range, but the Seattle Chocolates bars we good enough to make me want to track them down again. The Theo bar, however, was a bust. I love chocolate, and I love curry – but they just don’t play nice together in this bar. The Orange Appeal bar form Seattle Chocolates, which featured some very tough pieces of candied orange peel. Otherwise, it was delightful. I’m in the same boat as you when it comes to exotic foodstuffs with limited availability (awesome term, btw). I found these incredible chocolate bars while on holiday in San Francisco. However, since SF is now thousands of km away, I’m limited to eating a square every couple months in order to make the bars last longer. Gah.